Sure Terry. I'll arrange to put Stevie K there as a marshal for you! Seriously though Graeme and I would thank everyone who turned out on a cold, autumnal day yesterday. The race was almost full with nearly 340 runners registered and, in the event, our largest ever field of 295 runners completed the race with the usual wonderful support from our marshals encouraging them round the course. Harwich certainly showed its current strength in depth in being able to field 39 runners as well as being able to call upon a fantastic number of volunteers to ensure the event ran, as ever, like clockwork. There were some brilliant performances too, clearly benefitting from the new, faster, start: from Rob’s utterly incredible 26:50 to Elspeth winning her age category and that gold standard and Ann P and Brian H their county medals. A personal highlight for me was seeing the smiles on Steve K's and Angela P's faces when they told me about their superb PBs yesterday. Worth all the effort alone. Oh and Russell, of course, managed his 18th consecutive personal best which is an amazing achievement. I, personally, cannot wait to hear Peter’s report tomorrow at club night – it should be a real treat. So a well done to those of you who ran and, if you didn’t, a massive, HUGE thank you for marshalling, for helping out at the village hall and kitchen, in the finish area with results, medals and freebies, pouring out the free teas, for providing so MANY cakes, for washing-up and clearing away at the end and the myriad of other, different, ways that ensure things go so smoothly. The club more than proved it was able to cope with running one of the key road races of the year in Essex. Events like yesterday don’t happen by magic…but I do feel we again proved that there is a bit of magic running through our wonderful little club. 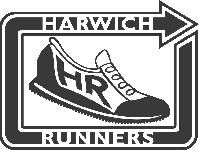 Hope you enjoyed another proud and great day to be a Harwich Runner – the best little running club in the world. No ‘probably’ about it.